Visibility of Blood Vessels in the Proximal Nailfold is a Biological Marker for Schizophrenia! Visibility of the nailfold blood vessels plexus has been known for a long time as a biological marker in schizophrenia. Schizophrenia became known for a high occurence of minor physical anomalies (MPA’s). Interestingly, one of the typical MPA’s in schizoprenia concerns visibility of the blood vessels in the proximal nailfold – a.k.a. ‘nailfold plexus visibility’ (NPV – which requires the use of a microscope for proper assessment). It concerns a minor developmental abnormality that has been studied as a hand marker for schizophrenia, but which lies outside the scope of the traditional MPA construct. Because nail fold plexus is commonly seen in the hands of young children, but not in adults. The statistics show that a high level of nailfold plexus visibility is relatively rare in the general population (occurring in 3-7% of healthy adults) while the rate of high NPV ranges from 20-70% in populations with schizophrenia (Curtis et al., 1999). Interestingly, over the years studies have suggested this hand characteristic is specificly related to the so-called ‘negative symptoms’ in schizophrenia (which are associated with deficits of normal emotional responses or of other thought processes). And EEG studies have revealed that this nail fold blood vessel condition may mark a process associated with abnormal brain development leading to schizophrenia – including: an inverse relationship between plexus visibility and lateral ventricle size in the brain. The PVS is reliably determined and stable over time. Interrater reliabilities for PVS reportedly range from .83 to .99 (Buchanan and Jones 1969; Maricq 1966). Taken together, researchers have concluded that findings on MPAs indicate that these minor anomalies appear to be part of some schizophrenia syndromes, representing a stable systemic or physical set of manifestations of the underlying neurodevelopmental processes that lead to the illness. This might explain why in the DSM-V the term ‘schizophrenia’ may be get replaced by the name ‘psychosis risk syndrome‘. The skin has a profuse blood supply, which is important in temperature regulation. The subcutaneous arteries form a network in the subcutaneous tissue, and from this is derived a subpapillary plexus in the dermis. Capillary loops in the dermal papillae arise from the subpapillary plexus, and from these loops the avascular epidermis is bathed in tissue fluid. A subpapillary plexus of venules gives the skin its pink color: the vessels become dilated when the skin is heated, and thereby make it look red. Just like is seen in the perspective of minor physical anomalies, nailfold plexia visibility is much more common in schizophrenia than in any other form of psychopathology. Studies have revealed that nailfold plexia visibility in schizophrenia is (much) more common than in other psychotic- & mood disorders – but these other disorders also show higher occurence than seen in the general population. Studies have also shown that that patients with schizophrenia with a highly visible plexus have greater oculomotor dysfunction, negative symptoms, symptom severity, chronic course, and neuropsychological dysfunction. Furthermore, nailfold plexus visibility appears to be at least moderately heritable. Other studies have revealed that nail fold plexus visibility has also been linked with hand markers in rheumatoid arthritis & hand markers in psoriasis. The pronounced subpapillary plexus visibility, greater number of vessels and their elongation are indicative of rheumatoid arthritis, while shorter, fewer capillaries and especially characteristic psoriatic capillaries, when present, suggest psoriatic arthritis. Changes of nailfold capillary patterns have been described in certain patients with systemic sclerosis, dermatomyositis, mixed connective tissue disease, and Raynaud’s syndrome. NOTICE: The nail tutor demonstrates how other nail fold characteristics can be associated with specific medical problems. More details about how to recognize various stages/variants of proximal nailfold blood vessels visibility in a palm reading, are presented in the picture below. Nailfold plexus changes are characterized by loss of (drop-out) nailfold capillary loops that surround the remaining, enlarged dilated capillaries. 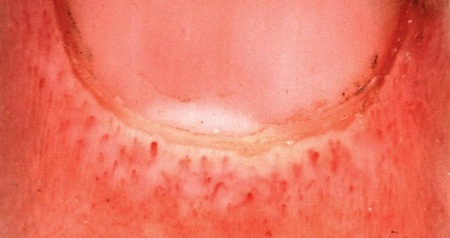 Upper left, A normal nailfold capillary pattern shows the uniform morphology and homogeneous disitribution of the small capillary loops just below the cuticle. Upper right, Capillaroscopy in a patient with systemic sclerosis illustrates dilatation of isolated capillary loops, with loss of surrounding loop structures. Lower right, The abnormal pattern is from a patient with childhood dermatomyositis. Dilated capillary loops are present, as well as areas of arborized clusters of capillary loops. 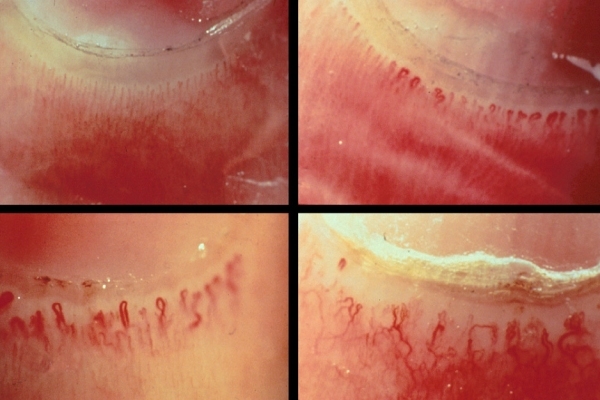 Lower left, Distortion of the normal capillary loop architecture is seen in a patient with adult dermatomyositis. Note the loss of normal homogeneous distribution of the capillaries and the alterations in the morphology of the vessels, including the dilated and enlarged “giant” capillary loops.